I live in Alaska. When you’re this far north, summer daylight is never-ending. We go months without seeing a star other than our sun. It’s no coincidence that this blog essentially goes into hiatus during the summer months. After a very long and dark winter, my interests naturally shift back to things on the Earth, rather than above it. With autumn comes darkness, bringing the added benefit of it still being warm enough to spend plenty of time comfortably observing the night sky. Last weekend, I watched the first stars wink on since Spring. The first star of my stargazing season was the brilliant cornerstone of the constellation Aquila (the Eagle), Altair. Altair is our relative neighbor, at only 16.8 light years from our solar system. Its proximity, size (1.8 times the mass of the Sun) and luminosity (11 times that of our host star) make it one of the brightest stars in the night sky. Altair is rapidly-rotating, completing a revolution around every 9 hours. For contrast, our sun completes a revolution about once every 30 days. This rapid spinning actually influences the star’s shape, flattening it out slightly and giving it a more oval shape–think about how pizza dough flattens out when a pizza chef spins it overhead. For me, Altair marks only the beginning of a long winter of dark skies. I’m looking forward to it. Which Star Is The Smallest? There are many different types of stars, ranging from the smallest red dwarfs to the largest red super giants. Aside from diameter, stars vary tremendously in temperature, mass, brightness (or luminosity, depending on context), color and lifespan. The Universe is home to an amazing amount of stellar variety. So back to the question: Which star is the smallest? Before we answer that, I feel I do need to provide a sort of disclaimer: In the context that we’re going to answer the question, when we refer to “smallest”, we’re referring to the diameter of the star, as in the size of its shape. We’re not talking about how massive (think weight) the star is1, or how bright it appears to us on Earth, but how large it would be if you lined it up next to other stars and compared its size. We’re also going to exclude neutron stars (the remnants of supernova explosions of massive stars), white dwarfs (the remnants of dead stars that are less massive than the ones that create neutron stars), and brown dwarfs (commonly referred to as ‘failed stars’). One more thing: The Universe is huge and there are trillions of stars in it that we’ve never observed. So, our answer is only going to be based on stars that have actually been observed. Now, without further ado. 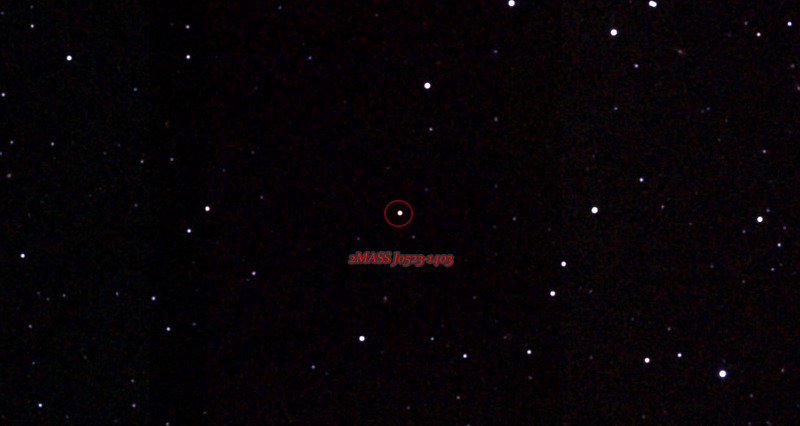 The smallest star that we have currently observed is the prosaically-named: 2MASS J0523-1403 (Update: Months after this post was originally published, an even smaller star was discovered: EBLM J0555-57Ab. ).2 The size of 2Mass J0523-1403 was listed in a 2013 paper published in The Astronomical Journal. The researchers of that paper (Sergio B. Dieterich, Todd J. Henry, Wei-Chun Jao, Jennifer G. Winters, Altonio D. Hosey, Adric R. Riedel, John P. Subasavage) set out to determine the point when a body becomes a star rather than a brown dwarf (failed star). They took data from existing sky surveys and chose 63 nearby red and brown dwarfs to study. Armed with the luminosity and temperature of these bodies, they calculated their diameters using the Stefan-Boltzmann Law. They then plotted the calculated diameters against the temperatures and were able to discover a theoretical lower limit for the diameter of a star: .086 the diameter of the Sun (roughly the size of Saturn). At that point, sat 2MASS J0523-1403, located about 40 light years from here, in the constellation Lepus. And as I said before, we don’t know that this star is the smallest star in the entire universe but because of this research we know that this star is about the size that marks the smallest point a star could be. The relation between size and temperature at the point where stars end and brown dwarfs begin – Image credit: P. Marenfeld & NOAO/AURA/NSF. 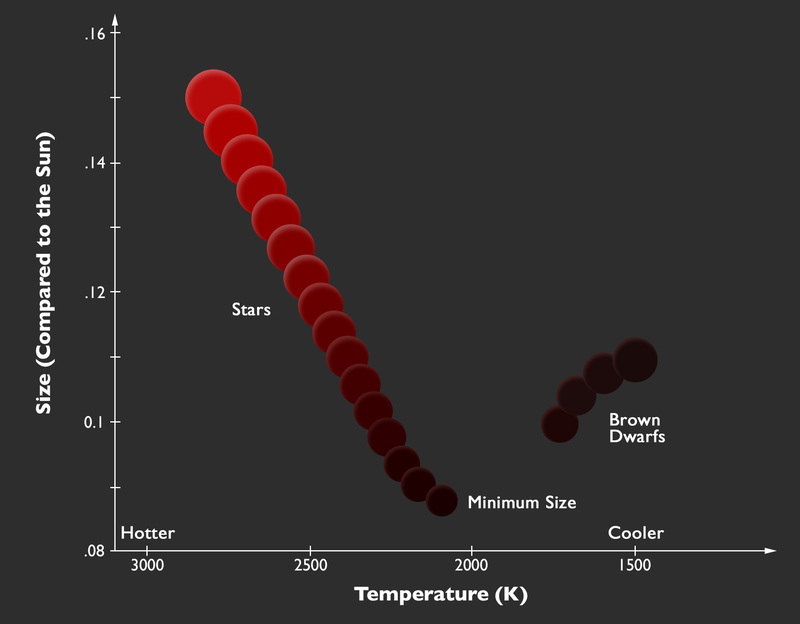 The above graphic shows the relationship between size and temperature, at the point where stars end and brown dwarfs begin. Interesting to note is that there are brown dwarfs that are actually larger than some stars. 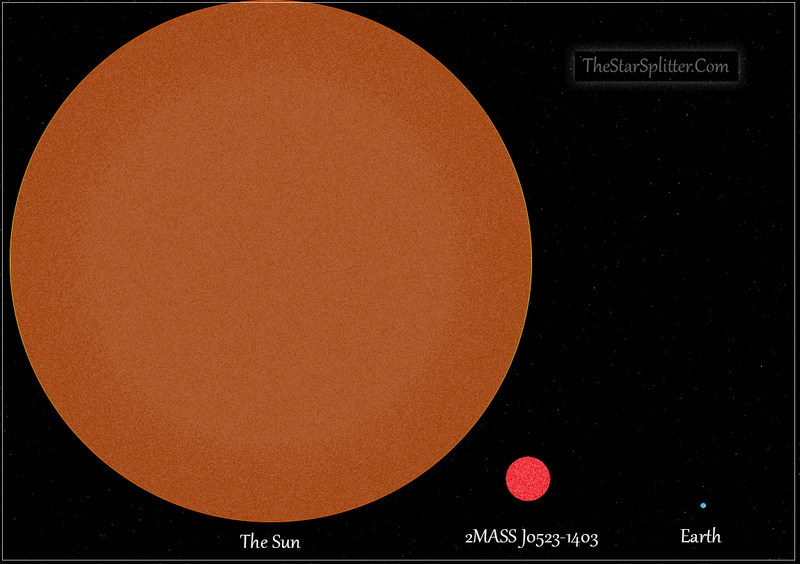 8.6% is a small fraction of the Sun’s size, but compared to the Earth our new little star friend is still pretty big. You could stack 9 Earths in a row and they still wouldn’t be quite as wide as 2MASS J0523-1403. 2MASS J0523-1403 is just slightly larger than Saturn, and could easily fit inside Jupiter. And there you have it: The smallest star in the Universe (that we know of, but this is as small as they can be, but then again there are trillions of stars we have never seen so it’s likely there’s one slightly smaller, maybe by only a few meters, but this is close enough, and then a couple months after posting this we discover an even smaller star….). I first read this story on April 1st and thought it might possibly be an April Fool’s prank. It turns out it wasn’t. Director James Cameron is re-releasing his 1997 film Titanic, to commemorate the 100th anniversary of that “unsinkable” ship’s sinking. He intends to change very little from the 1997 release but there is one change being made that makes reporting it fit the theme of this blog: when watching the movie at the theatre during its original release, astrophysicist Neil deGrasse Tyson noticed that the star field in the background of one of the scenes wasn’t accurate. But, instead of just filing that inaccuracy on the shelf with all of the other thousands of scientific errors you’ll find in popular movies and moving on, Neil deGrasse Tyson couldn’t let it go, and on more than one occasion allegedly attempted to alert Mr. Cameron of the error. Oh, there is one shot that I fixed. 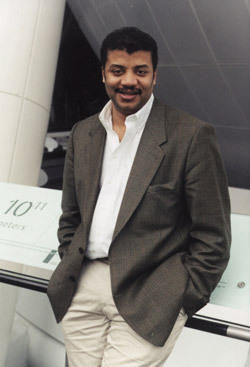 It’s because Neil deGrasse Tyson, who is one of the U.S.’ leading astronomers, sent me quite a snarky email saying that, at that time of year, in that position in the Atlantic in 1912, when Rose is lying on the piece of driftwood and staring up at the stars, that is not the star field she would have seen, and with my reputation as a perfectionist, I should have known that and I should have put the right star field in. So I said, ‘All right, you son of a b****, send me the right stars for the exact time, 4:20 a.m. on April 15, 1912, and I’ll put it in the movie.’ So that’s the one shot that has been changed.